Bedding company Therapedic Caribbean has been contracted to outfit the Hilton Rose Hall Hotel in Montego Bay, an arrangement that is expected to run for another two years. The 489-room hotel is locally owned by Sagicor Real Estate X Fund, a member of Sagicor Group Jamaica. Therapedic has already supplied 850 mattresses and 850 bed foundations to the beachside property, all for $60 million. Local bedding company Therapedic Caribbean has signed a $60-million contract with Hilton Rose Hall hotel to supply mattresses and box foundations for the refurbishing of the 489-room hotel. The Montego Bay, St James resort, owned and operated by the Sagicor Group, made an exception to its long-standing procurement procedures by appointing a Jamaican bedding manufacturer as a preferred supplier of customised sleep products to the hotel's international specifications. Local bedding manufacturer, Therapedic Caribbean, landed a $10-million contract to supply Half Moon Resort in Montego Bay. This is the second major contract awarded to Therapedic from Half Moon. In 2004, the local bed maker was commissioned to develop an ultra-luxury memory foam sleep system ,which they named the Half Moon Memories. The thousands of local products on display at Expo Jamaica, and the warm reception they received, left no doubt about the ability of this small island nation to produce high quality items. Jamaica Expo 2012 kicks off! Some of the island�s most innovative products, several utilising the latest technologies, were on display at yesterday�s opening of Expo Jamaica 2012 at the National Arena in Kingston. Today, the Morgans Group, just a year shy of its landmark 25th anniversary, is a family-run, vertically integrated conglomeration of three firms that drill deep into the manufacturing industry. Hidden in the exclusive Rose Hall enclave of the Half Moon Resort is a tranquil oasis, and although still a work in progress, it already speaks to something special, and not surprisingly, has already been sighted in the pages of those ultra- influential glossies. They say, “like father, like son”, but when it comes to business, the younger generations of Jamaican entrepreneurial families have chosen to chase more elaborate ambitions in lieu of adhering to family tradition— adding cutting-edge appeal and diversity to compete in the modern market. Designed to reflect the natural beauty and tranquility of the Caribbean, the new spa suites at Half Moon are a contemporary marriage of Jamaica’s diverse past with state-of-the-art custom amenities. Sleep deprivation is said to hinder the production of natural growth hormone, according to Dr. Richard Gaines, a medical practitioners from the Cenegenics Medical Institute in the US that specializes in age management techniques. 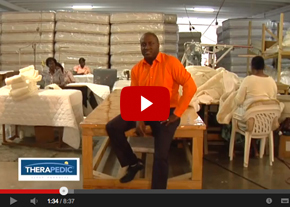 Kingston, Jamaica— Therapedic licensee Therapedic Caribbean has presented its top sales award to Singer Jamaica Ltd., the bedding producer's largest retailer on the island.